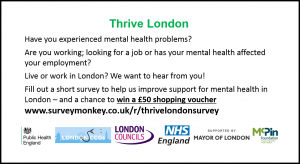 Thrive London is a citywide movement for mental health supported by the Mayor of London, the London Health Board, and the Greater London Authority. They want to find out how to better support people with their mental health at work, and also how to help people with mental health problems find work. You can help us by filling out this survey – and you can choose to be entered into a prize draw to win £50 worth of shopping vouchers as a thank you for taking part! We know that talking about mental health at work can be difficult and we’d like to reassure you that everything you say will be anonymous. You don’t have to provide any personal details, unless you would like to be entered into the prize draw, or are happy to be contacted for some follow-up research.